In the final weekend of the La Liga season, not only will we see Champions Barcelona crowned, but the culmination of the thrilling dog-fight for survival along with the heated race for 3rd and 4th place. Here, we break it all down from farewells to frenzies—with incisive betting tips you can certainly take to the bank. An Andalusian Derby takes place at Rosaleda as Malaga must beat Sevilla and hope Bilbao don't beat Villarreal at San Mames to secure that seventh spot whilst Sevilla must win and hope Almeria can get something against Los Che if Sevilla are to secure fourth place and qualify for the Champions League in the process. Malaga's away form in 2015 is abysmal and yet again cost them last weekend as they lost 2-1 to the Yellow Submarine at El Madrigal and they are ending this season playing the games that's all because they just look awful right now. Malaga were superb in the first half of the season and at home they were just brilliant even Barca were held to a 0-0 draw at Rosaleda but the second half of the season has seen them drop out of the race for the fourth, kill off any chance of sixth and see them now looking unlikely to secure seventh spot which they've held for the majority of this season. Malaga finished 11th last season on 45 points so to sit 8th this season on 50 points with a game to spare and to have a chance of qualifying for the Europa League next season is an improvement for this young and exciting Malaga side. But to now head into the final day with the race for seventh spot a position they've held for such a long time this season is a dreadful state of affairs and you have to be hard pushed to see them actually finish in that seventh spot come Saturday night you really do. Malaga have lost just four times at home this season which is still impressive but their lack of goals has been a disappointment this season so it's no surprise to see them with the tenth best attacking record in La Liga this season. Defensively Malaga are pretty good especially at home where they have conceded just seventeen goals this season and that gives them the sixth joint best home defensive record in La Liga this season along with Villarreal. Their form of late remains poor though with just one win from their last nine matches with them drawing three and losing the other five and conceding in each of their last ten matches too and that shows their poor form in an even worser light for them. Malaga have scored in fifteen of their eighteen home games this season and conceded in eleven of those eighteen keeping seven clean sheets at home this season which is decent to be fair but their home form in 2015 has produced just three wins and that's just not good enough if you want to be qualifying for Europe. Sevilla come into this one after beating Almeria in yet another Andalusian Derby 2-1 after going behind and they fully deserved the win and it just summed up their home record and their superb season so far by managing to come back against an organised Almeria side fighting for their lives in such a big Andalusian Derby. Unai Emery will stay in my opinion providing Sevilla qualify for the Champions League which they will do via winning the Europa League and retaining it which I've said they will do all season and now they face Dnipro in it I'm even more confident. However they can still somehow reach the Champions League via La Liga as they sit just one point behind Los Che in the race for that fourth spot going into the final day and Emery's men deserve a huge amount of credit and respect. They've managed to reach the Europa League final again which in itself is an unbelievable achievement but to maintain your league form whilst doing so and continue to push Los Che all the way in the race for fourth and send that race for fourth into the final day of the season is quite impressive. Andalusia's most successful football club are infact Sevilla and they've already broken one record this season with a game to spare which is their current tally of 73 points which is their highest La Liga points tally in their history EVER. Sevilla's away record is the fourth best in La Liga this season with nine wins, two draws and seven defeats which has hampered any possible involvement from them in terms of them being involved in the title race themselves at some point this season. Defensively they do give you a chance on their travels though and with 30 goals conceded giving them the 13th worst away defensive record in La Liga this season it's plain to see why but that isn't going to hinder them when they have the third best attacking record on their travels in La Liga this season with 30 goals scored which is five more than Atleti and Los Che. Sevilla have the third best overall attack in La Liga this season and they won't really be too fearful of a trip to Rosaleda to take on a Malaga side with just three home wins from their last ten home games and no win in any of their last four home games. Sevilla's away form of late has them unbeaten in their last six away games with four wins and two draws and here's some impressive stats from their eighteen away games so far this season, they have scored in sixteen of their eighteen away games this season and conceded in fourteen of them with "Both Teams to Score" paying out in twelve of their eighteen away games this season. What could cost Sevilla that fourth spot is the 3-1 defeat away to Los Che at Mestalla back in January which played a huge part in the head to head stakes between the two plus away defeats to Getafe and La Real in February. Sevilla may put a weakened side out here but even that could prove strong enough to see off Malaga, Bacca with his 20 goals may be at Atleti next summer or elsewhere or even possibly remain at Sevilla but when you can rest your key man and replace him with Gameiro with his eight goals or Aspas it really is no concern. From a betting point of view of both teams to score: YES is the best bet here and should pay out, it's paid out in seven of Malaga's last ten home games and paid out in nine of Sevilla's last ten away games and I'm confident it will pay out here. Malaga have won two of the last five Andalusian Derbies between these two with Sevilla winning the previous meeting earlier this season at the Ramon Sanchez Pizjuan in the Andalusian Capital back in January in a 2-0 home success and the other two Derbies ending in draws. Malaga won this Andalusian Derby at Rosaleda last season in a 3-2 home success and Sevilla have lost two of the last three Andalusian Derbies at Rosaleda against Malaga and haven't beaten Malaga at Rosaleda since September 2010 in a 2-1 away success but remember no side has ever done the double in this particular Andalusian Derby. Unai Emery has done a superb job this season with Sevilla and deserves much more credit than what he is getting in my opinion and is slowly becoming one of the best up and coming managers in the whole of Europe. Four days after this game Sevilla will be in the Polish city of Warsaw to face Dnipro in the Europa League final and yet again we'll have a La Liga side in the Europa League final so that La Liga can yet again be showcased on the big European stage again. This will be a tough game for Sevilla away to a Malaga side in a big Andalusian Derby in which Malaga need to win to have any chance of clinching that seventh spot but Sevilla know that a win will put big pressure on Valencia who also play in Andalusia away to Almeria and I'm backing Emery's men to win this Derby by a goal. Best Betting Tips: Bacca to score anytime (if he starts), Sevilla Over 1.5 Goals, Over 2.5 Goals in the match and YES to "Both Teams to Score". 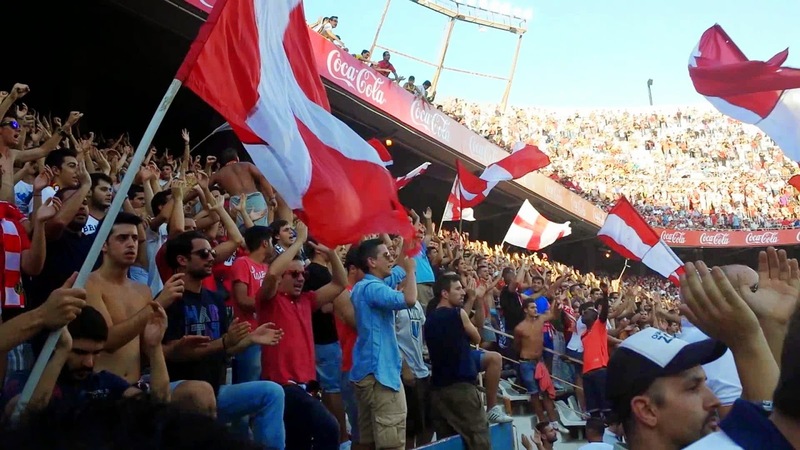 Almeria lie on the brink of relegation to Liga Adelante for the first time since 2011 and host Los Che who must win this one to secure fourth spot and in the process Champions League qualification but it won't be easy on the Andalusian Coast. Almeria look doomed after last weekend's Derby defeat in the Andalusian Capital against Sevilla which ended 2-1 but it was their last home game in yet another Andalusian Derby which brought a 2-1 defeat against a Malaga side who are poor on their travels and Almeria's last lifeline/last winnable game disappeared and so did their chances of survival quite possibly. Almeria finished 17th last season just one point outside the relegation zone and it's something they could quite quite easily manage to do yet again this season and you wouldn't put it past Sergi's men against a Los Che side who look a completely different side on their travels to the one we see at Mestalla. Almeria's home record would place them in the relegation zone but it's improved under Sergi who has steered them to their best home form of the season and their home record now reads three wins, seven draws and eight defeats. Almeria's home defensive record is the the 15th best in La Liga this season whilst their eighteen goals scored at home this season gives them the third worst attack at home in La Liga this season and overall they are the joint fifth lowest scorers with Deportivo in La Liga this season. Almeria defensively have been more organised and harder to beat under Sergi but that still doesn't change the fact that they have the sixth worst defence in La Liga this season with 61 goals conceded and their recent home form of late shows why it could cost them their place in La Liga. Almeria's recent home form shows just the improvement under Sergi with just two defeats in their last nine home games with them winning three and drawing the other four and scoring in seven of those nine home games. Almeria have scored in twelve of their eighteen home games this season but have conceded in sixteen of those eighteen which makes it incredibly difficult to win games and if you don't win enough of your home games survival is going to be even more difficult. If Los Che miss out on the top four it'll be down to their away record which is the fifth best in La Liga this season showing six wins, eight draws and four defeats and even though they haven't lost many it still shows far too many draws which has denied them a chance to challenge Los Blancos and Barca for the title and could cost them fourth spot. Los Che have the fourth best defensive record on their travels in La Liga this season and also have the joint third best away attacking record with Atleti in La Liga this season, overall Los Che the joint fourth best attack with Atleti in La Liga this season and the third best defence. Los Che finished 8th with 49 points last season so to sit in fourth spot on 74 points with a game to spare this season and in pole position to qualify for the Champions League is a huge improvement and Nuno deserves much credit for steering them there. Los Che will be disappointed to have failed against Celta last weekend and only draw 1-1 with them being at home knowing a win would secure fourth spot but if you had told them at the start of this season 'Win away at Almeria on the final day and you'll be in the Champions League'. Los Che would have certainly taken it but fail to secure fourth spot and Peter Lim could wield the axe on Nuno and it's well reported that he's a ruthless man who wants to see a return on his investment and Nuno could feel the force of that if they surrender fourth spot to Sevilla. I hope Nuno stays whatever happens because he's done a great job with his squad but the lack of goals has to be addressed in the summer because when your midfielder Parejo who's had a superb season is your top scorer with 12 goals and you have Paco your young striker on ten goals and Negredo on just five goals who's your main striker then you've big problems. Los Che would do worse than to look at Chicharito next season because he would be absolutely perfect but they have to keep their faith in Paco who is a good talent upfront with much promise and they definitely must get more goals out of Negredo because five goals just is not good enough. If Los Che get fourth spot then I'll look back at the 3-1 win over Sevilla at Mestalla in January proving to be the difference but this race should not have gone down to the final day but full credit to Sevilla and for Los Che it'll be more relief on the Andalusian Coast than joy if they do secure fourth spot on Saturday evening. If Almeria are relegated then draws at home to Deportivo and the defeat to Malaga and the 4-1 hammering against Levante in what was a crucial six pointer at the time and their lack of home wins before Sergi comes in will have been the difference. Los Che have scored in fifteen of their eighteen away games this season and conceded in fifteen of those eighteen with "Both Teams to Score: Yes" paying out in twelve of their eighteen away games this season. Betting point of view: You believe Both Teams To Score-YES is the best bet here but for me that's with risk because I see Los Che keeping it tight at the back here and Almeria's goals conceded ratio increasing further so Valencia Over 1.5 Goals is the best bet here and it's paid out in four of their last eight away games and I see it paying out here too. Los Che won the previous meeting at the Mestalla earlier this season back in January in a 3-2 home success and have won four of the last six meetings with Almeria winning one and the other one which was this exact fixture last season and that ended in a 2-2 draw. Los Che enjoy their trips to Almeria though and have won three of their four visits and never lost away to Almeria on the Andalusian Coast and another win here will see them return to the UEFA Champions League. Los Che are subsidising travel costs to Almeria and urging as many Los Che supporters as possible travel to Almeria to roar them on so expect a 13pt away following to head down to Almeria and look to roar Nuno's men over the finishing line. This will be far from easy for Los Che and it's going to be a nervy game for both sides and it could be decided early on or it could require a late goal but the result in this game will have dire consequences for the loser and I see that loser being Almeria as they are relegated to Liga Adelante. Goodbye Almeria, make sure you come back at the first attempt to La Liga because we'll miss your superb home support and your beautiful city! Granada look set to achieve the great escape unless Almeria and Eibar both win their games and Granada will host Atleti at Estadio Nuevo Los Carmenes with eyes and ears likely to be on events in the Catalan Capital and the Basque Country. Jose Ramon Sandoval the manager of Granada is the only manager of the club this season to have recorded three wins and he's done them by managing the team for just three games and it's an incredible stat and this guy was brought into replace the sacked Abel Resino with the team looking already relegated. He's done a brilliant job because this team were looking doomed, gone, relegated and I kept saying for two months straight I had them in my bottom three and they are relegated proving me right end of story, there's no way they'll survive they are gone for me. They've proved me wrong in the best possible way and they've proven that sacking your manager towards the end of the season really can pay and really can reward you but fair play to the Granada supporters too who have all along chanted that they believe their side could survive and pull off the great escape. Given Depor face Barca and Almeria host Los Che you'd really have to believe that Granada are going to pull this off and spark wild scenes at full time on Saturday evening and I would be really delighted for them believe me because it's a great stadium set in a beautiful location with the view of the mountains in a superb city and it'd be a shame if we lose Granada from La Liga. 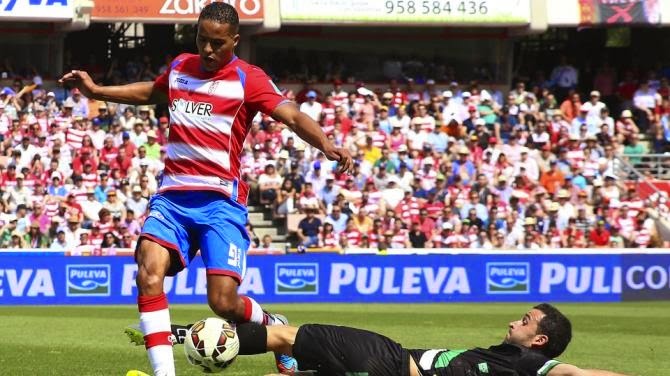 Granada finished 15th last season on 41 points two points outside the relegation zone and this season with a game to spare they sit 16th on 34 points two points outside the relegation zone dreaming and hoping they can pull off the great escape. Granada were last relegated from La Liga in 1976 and will be desperate to make sure they don't return to Liga Adelante but it's going to be difficult against an Atleti side who still need a point to secure third spot and in turn automatic Champions League qualification in to the group stages. Granada's home record this season shows just five defeats which for a side fighting relegation is quite incredible and they have the joint sixth best home defensive record in La Liga this season with Malaga and Villarreal but their attacking record at home lets them down which is the second worst in La Liga this season. Overall in general Granada are the second lowest scorers in La Liga this season with just 29 goals scored so to stay up on that alone would be incredible and with 64 goals conceded they have the joint third worst defence in La Liga this season with Rayo. Granada's home form of late shows resistence with just two defeats against Barca and Espanyol in their last nine home games with them winning three and drawing four, their lack of wins and goals to win games especially in the relegation six pointers which prove crucial is something I was convinced would cost Granada but somehow they look likely to pull off the great escape. Granada have scored in eleven of their eighteen home games this season and conceded in eleven of those eighteen keeping seven clean sheets and those clean sheets could play some part in the great escape they are desperate to pull off. Atleti come into this game after losing their La Liga crown to Barca at the Calderon last weekend which was quite fitting given that they won their La Liga title last season against Barca at the Camp Nou but this season has been a failure for Atleti in my opinion. The amount of slip-ups from Barca with their poor home defeats and poor first half of the season, the edge Atleti have over their Madrid rivals in the Derbies have all represented the best chance Atleti may ever have of retaining a La Liga title. Atleti's away record may be the third best in La Liga this season but four defeats and five draws and their poor away form at the start of 2015 which saw defeats at Celta and disappointing draws at Espanyol and Malaga have seen their post winter break kill their season. In the Champions League Simeone made mistakes and played too cautiously and he will learn from his mistakes next season and build an Atleti side that will be stronger than this season and make sure it improves its away from which helped them win the La Liga title last season. The reliance on 22 goal Griezmann, the lack of goals from Torres (3 goals) and Mandzukic (12 goals) hasn't helped them one bit and with Tiago their top scoring midfielder aged 34 years old with five goals shows a lack of goals and it's been their weakness well one of them anyway. Overall Atleti haven't been at the level they were last season and even though they have been weakened individually by the departures of Courtois and Luis the team is still as strong overall as it was when they won the title in my opinion. Bringing Torres back has brought hard work and stretched the weaker sides in La Liga away from home but it's not brought goals and it's a signing that just hasn't worked in my opinion and I think Simeone is regretting making the move. Joint third best attack in La Liga this season and the second best defence shows that with additions in the summer Atleti will challenge for the title next season but their challenge must be better than this one because they sit sixteen points off Barca with a game to spare and that's poor. Atleti are being linked with so many strikers now with Jonathas, Vietto and Bacca being heavily linked and it's no surprise to see them being linked with plenty of strikers because like me Simeone sees where Atleti need strengthening the most and it's up top! Atleti remain an excellent side and the best defensive side in the whole of Europe and believe me with the right additions in the summer in those attacking areas they'll be one potential mean beast next season and it's a huge summer for Simeone and the club. Atleti are in good away form unbeaten in their last seven away games winning three of them, drawing four of them and keeping a clean sheet in four of them too and their defensive solidness on their travels has been rewarded in recent away trips. Atleti have scored in fourteen of their eighteen away games this season and conceded in just ten of those keeping eight clean sheets on their travels this season and that's a decent stat for Atleti given their lack of goals putting more pressure on the defence at times. From a betting point of view Granada are the second lowest scorers in La Liga this season and now face the second best defence in La Liga this season and this game is pretty much nailed on for Under 2.5 Goals and Under 2.5 Goals is very much likely to pay out here. Atleti have never lost to Granada and have dominated all seven meetings against the Andalusians winning six and drawing one and won the previous meeting this season at the Calderon back in January in a 2-0 home success and not only did they win in Andalusia last season 2-1 but they've won their last two visits and never lost. This will be tough for Atleti but a point is a must because finishing fourth just is not acceptable and a Champions League play-off isn't what Atleti want and they'll edge this one by getting the victory whilst Granada wait on news from the Catalan Capital and the Basque Country but surely Jose Ramon Sandoval will be given the job on a permanent basis next season. Congrulations Granada on survival if you do survive because it's been one of the greatest escapes I've ever seen and Jose Ramon Sandoval deserves a huge amount of credit! Best Betting Tips: Griezmann to score anytime (if he starts), Atleti Under 2.5 Goals and Under 2.5 Goals in the match. The only people who will be hoping Eibar are relegated are Deportivo, Almeria and Granada supporters because everyone else will be praying they survive in their first season in the Spanish top flight and a home game against already relegated Cordoba is the best fixture Eibar could have been given for the final day. Eibar's dream of survival looked fantastic in the first half of the season picking up 27 points and sitting closer to Barca and Los Blancos than the relegation zone but the second half of the season has seen them pick up five points as their form has seen their season collapse completely. Eibar now sit in the relegation zone and that 5-2 victory against Almeria in January could prove the difference because they have scored one more goal than Almeria did in the two meetings the sides had and that gives Eibar the advantage in the head to head stakes, this means Eibar have more chance of survival than Almeria if Depor or Almeria lose. Eibar's home form this season has shown just four wins, three draws and eleven defeats with one of the worst home defensive records this season in La Liga and one of the worst attacking records at home this season in La Liga. Eibar's recent home form is nothing short of abysmal with eight defeats in their last nine home games and the other being a 1-0 win against Malaga who as I keep saying are abysmal themselves on their travels in 2015 but Eibar did manage to win a game again in 2015! In La Liga in 2015 Eibar have played ten games losing eight and winning just two and they've scored in five of those ten conceding in nine of them. Eibar's top scorer has eight goals and their other striker has six goals and only one defender/midfielder has scored more than one goal this season and with only fourteen goals from your two strikers it's always going to be tough to win enough games. Eibar's away record this season has been superb and has seen them pick up 17 points on their travels and that is a record their relegation rivals would be jealous of and Eibar's away record has been where most of their points have come from. Eibar's 3-3 draw at home to Levante and their 1-1 draw at home to Granada could well prove the difference if they are relegated but if Eibar do pull off their dream of surviving in their debut season in La Liga then their away record which includes wins away to Elche, Rayo, Celta and Espanyol plus draws away to Sevilla, Bilbao, Cordoba, Granada and Getafe will have been what has kept them up. Eibar are a great success story and it's been fantastic to see them in La Liga this season and it'd be truly superb to see them play another 38 games at this level next season but that possibility looks less likely now than it did before Christmas. Cordoba come into this already relegated with nothing to play for but pride and their relegation was confirmed just a few weeks ago and there isn't much to say on them really that I haven't already said this season. Their form is truly awful with no wins since January and their away form just says it all really with no wins in their last nine away games with two draws and seven defeats and they have failed to score in seven of those nine conceding in all eight of them too. Cordoba's away record is the worst in La Liga and they are the lowest away scorers in La Liga this season with just ten goals scored too and have the second worst defence in La Liga with 65 goals conceded and are the lowest scorers with 22 goals scored in La Liga this season. Last season's bottom team were Real Betis who finished with 25 points, the previous season it was Real Zaragoza on 34 points and the season before that it was Racing Santander on 27 points meaning that even a win for Cordoba here will see them be the worst relegated team points wise in the last four seasons. President's mistakes, manager sackings that weren't needed and mismanagement is Cordoba's relegation and poor defending of course and it's all explained in a nutshell and I can't see Cordoba returning to La Liga anytime soon but I hope they prove me wrong I really do. Cordoba have never beaten Eibar and most of the meetings have come in Liga Adelante but the first ever meeting in La Liga came in Andalusia back in January in a 1-1 draw, Cordoba's last three visits to Ipurua have all ended in defeats and the last two ended 1-0. From a betting point of view Under 2.5 Goals should pay out here and has paid out in six of Eibar's last nine home games and also paid out in seven of Cordoba's last nine away games and it will pay out here in a low scoring game. Eibar have scored in ten of their eighteen home games this season and conceded in sixteen of them whilst Cordoba have scored in eight of their eighteen away games this season. 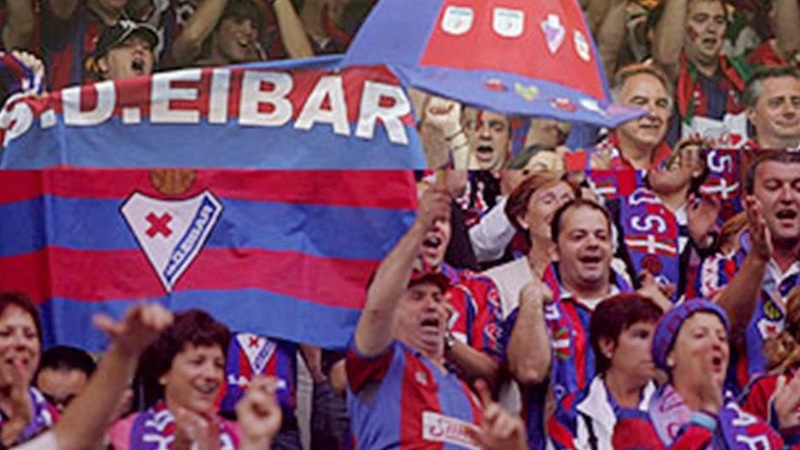 This will be a nervy game for Eibar but they'll have their superb fans and the whole town behind them and I've said they'll stay up and I still believe and this game will be the one that they win and the one that sees them limp over the line and spark wild celebrations in the town as Eibar survive in their debut season in Spain's top flight. Eibar will be bang up for this and I'm convinced they'll win this one but the person who scores the winning goal for Eibar in this one will be the hero of a small town in the Basque Country in the Northern part of Spain, what a chance and what a day. Congratulations Eibar on your survival if you manage to prove me right because your effort, hard work and brilliant first half of the season deserves survival. If you go down it's been a joy to see you play in La Liga and the memories you'll take away will be cherished by many in the town. Champions Barca will lift their 23rd La Liga title at full time but matters on the pitch still are to be decided with Barca having the chance to finish on 96 points whilst Depor need to win to avoid relegation incase Eibar or Almeria win. Barca confirmed their 23rd La Liga title at the Calderon last weekend in a tight game where they brilliant defensive solidness in the second half of the season and the wonderful Messi proved the difference and saw them over the line. Los Blancos have played the better football at times this season especially in the first half of the season but in the second half of the season Barca have managed to be consistent enough, solid enough defensively, win the big games and produce a stunning turnaround in form to lift what is a well deserved title in my opinion. 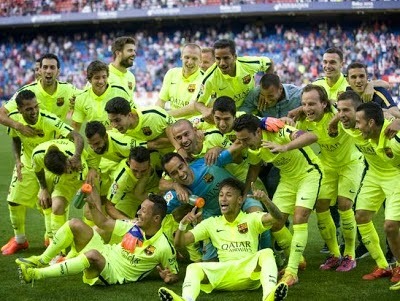 Overall over the course of this season Barca have been the best side in La Liga and fully deserve to win it even though you have to realise that this title was quite simply dropped on the floor from Los Blancos and Barca picked it up and ran away with it and that's exactly how they came to win this one. Barca's record of 19 goals conceded is the best in their history in a league season ever and that is some stat and although their defence has been exposed to the counter this season in the second half of the season it's looked a lot more solid and tightened up considerably. Barca's 48 wins so far this season is an all time club record beating their 47 wins total in 2011/2012 season and it's another club record created as is their 22 clean sheets in La Liga this season and they just love breaking records this club. Luis Enrique is likely to keep his job because I can't see any candidate in the elections coming out and saying they are getting rid of a manager that could potentially win the treble because their chances of victory in the election would reduce with Barca fans significantly. This is Messi's team and for Luis Enrique to take the credit I am just not having, this is a guy who doesn't speak to the players behind the scene, decided to take on Messi and fine him after the La Real game as he failed to turn up to a public training sessions days after it only to be persuaded by other key players at the club that it wasn't a good idea. Messi for me has improved his form due to early elections and after seeing Ronaldo winning the Ballon D'Or at the start of the year and he wanted to prove he was the best player in the world again but by showing it in a teamwork display whereas Ronaldo likes to show it in an individual display. Barca for me will win the treble which is quite incredible given the mess off the pitch with the Neymar tax case, elections being forced and called early for this summer and not to mention much more including the fact Barca B could be relegated from Liga Adelante and the fact that not enough good players are coming through from La Masia at the moment. Luis Enrique will get the credit and he'll get his CV enhancement but let's give Messi and the players the credit because this man does not deserve to take all the credit he really doesn't and yes he's done some good things tactically but even that's forced by the key players and Messi in my opinion. This will be Xavi's final league game for Barca as he is leaving to play in Qatar next summer and the memories of him will be remembered fondly in Catalonia and he will be cherished and go down in Barcelona history. Xavi and Iniesta is the best midfield pairing I have ever seen in my lifetime and I feel proud and honoured to have watched both live at Camp Nou and I firmly believe that we'll never ever see the likes of Xavi and Iniesta ever again. Barca's defensive record of just nineteen goals conceded has played a huge part in their title success this season and it's what helped Atleti win it last season funnily enough and Barca's defence is the best in La Liga this season and even poor home defeats to Celta and Malaga haven't denied them their 23rd title. They should also thank La Real because that result sparked early elections and a full blown crisis at the club and finally made Luis Enrique have to name a settled team and stop changing it week in and week out and finally play the front three of Messi, Neymar and Suarez every week. Barca now can enjoy their last home game of the season with two finals after it coming back to back with the Copa Final at Camp Nou next Saturday and the Champions League Final in June in the German City of Berlin. Barca have the best home record in La Liga this season with sixteen wins, no draws and just two defeats with 62 goals scored and nine goals conceded giving them the best home attack and best home defence in La Liga this season. Barca have scored in sixteen of their eighteen home games this season and conceded in eight of them and won ten of their eighteen home games this season without conceding making the Barca to win to nil bet a popular bet and given many punters a regular payout. Depor come into this one desperate to avoid another relegation back to Liga Adelante and looking to try and consolidate themselves back in La Liga and back in the top flight where a club like Deportivo belong they really do. Depor have won just one of their last fifteen games and that win came last weekend against Levante which could keep them up and leaves them outside the relegation zone by just two points heading into the final day sparking fear in Coruna. Depor's head to head records against Granada, Almeria and Eibar the three teams fighting to stay up and the only three teams involved in the relegation battle with them could really come back to haunt them come full time on Saturday evening. They have a worser head to head than Almeria and Granada and have failed to beat either side and have a better head to head record than Eibar by beating them twice meaning that a draw at Camp Nou against Barca will see them survive only if Granada and Eibar both lose. Depor are one of the lowest scorers in La Liga and their away record is the fourth worst with just two wins, seven draws and nine defeats and with just eleven goals scored on their travels this season they have the joint second worst attacking record on their travels in La Liga this season with La Real and they also have one of the worst defensive records on their travels this season in La Liga too. 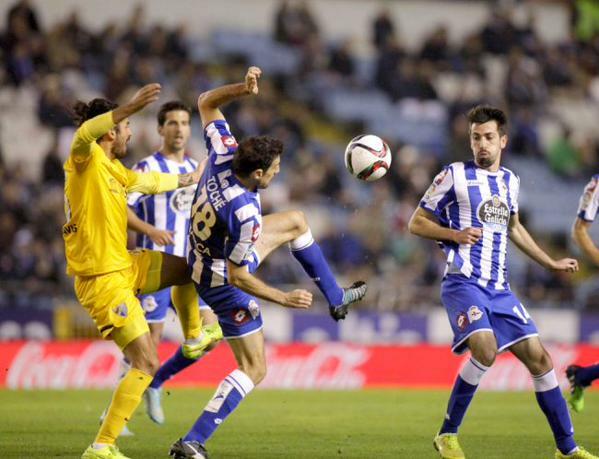 Depor have scored in nine of their eighteen away games this season and conceded in thirteen of those eighteen away games. If Depor do stay up then crucial wins at home to Levante and Eibar will have proved the difference but if they are yet again relegated then their lack of goals in winnable home games/relegation six pointers along with their poor head to head records against Granada and Almeria will have relegated them and deservedly so. From a betting point of view Barca Over 2.5 Goals is the best bet here as is Barca to win to nil and both should pay out in this one and has done in Barca's last four home games with them scoring fourteen goals in the process. Yet again we'll have a La Liga side in the Champions League Final and it yet again proves the dominance of La Liga sides in Europe and makes people jealous of what is the best league in the world by some distance right now. Barca have been given three days off and won't train until Thursday ahead of this game but even if this Barca XI is rotated by Luis Enrique it should still be one that is too strong for Deportivo whichever Barca eleven takes to the field on Saturday evening. Barca will have one eye on the Copa Final next weekend and the Champions League the weekend after as they have their eyes and focus set on the treble and will be hoping and praying Suarez's injury isn't season ending but they'll sign off the La Liga 2014/15 Season with a comfortable home win and relegating Deportivo in the process in my opinion. Goodbye Xavi thanks for the memories you'll be missed but you'll always be remembered and always be cherished in Catalonia, Good luck in Qatar! If Deportivo go down then it's deservedly so because their failure to score goals, failure to defend and their lack of wins in the winnable games/relegation six pointers is relegation material but I do hope they bounce back because Deportivo truly do belong in La Liga. If Deportivo stay up then congratulations to them on their survival but they must learn from their mistakes this season and improve the side in the summer especially in the attacking areas but if they do go down then they must stick with Victor Sanchez because he has done a good job since taking over and is the best man to get them back up in my opinion. Note: TheSportMatrix is not responsible for any losses on betting, this is solely advice. Thanks for reading and enjoy what promises to be another exciting climax on the final day of a La Liga Season as the curtain comes down on a truly wonderful season in La Liga and here's to the next one. From the race for Champions League to the relegation dogfight and Barcelona's coronation, we break down the final weekend of the 2014/15 La Liga season.